Showtime’s festivities at the Boardwalk Hall, Atlantic City, NJ started with Deontay Wilder’s ugly destruction of Nicolai “Stone Man” Firtha. Neither man deserves much attention. How Deontay can be viewed as a legitimate heavyweight contender is a mystery to me. Showtime’s Al Bernstein tried hard to describe Firtha as a real threat to Deontay. Al struggled to try and make viewers believe because he fought pretty well against Tyson Fury and that he could do the same against Wilder. It’s doubtful viewers bought Al’s efforts. His announcing partners, Mauro Ranallo and Paulie Malignaggi were probably holding their hands over their mouths to suppress laughter. As you surely guessed, Deontay scored yet another kayo. This time it occurred 1:26 of the fourth round, Several previous sloppy knock downs foretold the inevitable. The Stone Man was operating under false advertising. The early knock downs were necessary to demonstrate Deontay’s punching power was more than that of a wind turbine. Fans seated at ringside swore they could hear a slow methodical whoop whoop sound similar to those heard at a wind farm. Regardless, Deontay now claims he’s ready for anyone. So the fairy tale continues. The next fight proved much more entertaining. It pitted WBO middleweight champion Peter “Kid Chocolate” Quillin against game challenger Gabriel “King” Rosado. The question going into the contest was whether Rosado would be able to withstand the power of Quillin. Rosado already proved his toughness against Triple GGG, Gennady Golovkin, so the expectation was he could take Quillin’s punches as well. A flash knockdown in round two caused many to second guess themselves. Rosado calmed their fears by quickly rising, apparently unhurt by setback. As the fight progressed, Quillin began having trouble landing his signature left hook. He continued to fire off lead right hands, followed by the left hook. Rosado started to avoid those shots, or at least roll with them. Then he began landing his own lead rights, and doubling up on his jab. Whenever he got Quillin backed up, which was often, he had success. Quillin was definitely at a disadvantage when he had to fight off of his back foot. However, for the most part, he didn’t linger on the ropes as much as Rosado wanted. When at center ring, Quillin’s hand speed was tough for Rosado to handle. In one good exchange in round nine, Quilllin landed a powerful counter jab. He had his weight behind it, and Rosado rushed in to magnify the punch, so it was particularly damaging. Rosado came out of the fray with a bad cut to the eyelid of his left eye. The cut couldn’t have been in a worse location. The thin protective shield was sliced almost its entire width. Still, Rosado wasn’t concerned. He remained focused, wanting to pound Quillin into submission. The problem for Rosado was in convincing the referee Allan Huggins and the ringside physician that the cut didn’t hurt, and it wasn’t affecting his ability to see. He failed to do so. Neither man was convinced. They were concerned about Rosado’s ability to see later if the fight was allowed to continue. They knew the wound would be targeted by Quillin, just as any opponent would do. Hence, the ringside physician ignored Rosado’s pleas and instructed the referee to stop the fight. The official time was .040 of the tenth round. Rosado was crushed with disappointment. Twice now he tried his hand at the middleweight title(s), and both times cuts derailed his efforts. So. once again the King is without a throne. Naturally talk of a rematch surfaced. 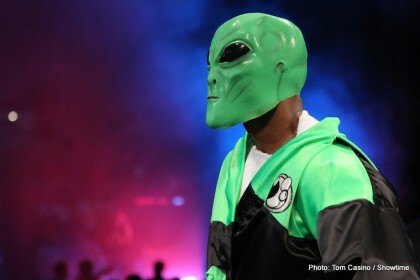 Bernard “Alien” Hopkins, green mask and all, was too wily, or unworldly if you prefer, for Karo Murat. 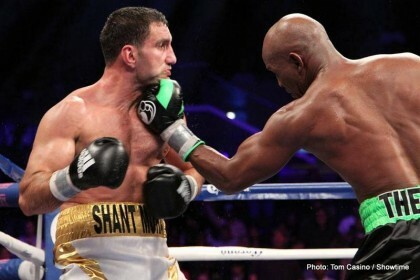 The opening bell sounded, and before the blinking of an eye, the 48 year old champion had Murat in a clinch! That has to be some kind of record? Starting slow is one thing, but this was ridiculous. But, by the third round, the old man, formally known as “The Executioner” was in sync with the awkward rhythm of the Iraqi from Germany’s attack. The rest of the fight contained all of Hopkins usual antics. At times he would lead with his head. Or, he would hold and push down on the back of Murats head. When Murat tried to get rough and dirty with the master of such action, Hopkins would demonstrate the true version. Several times he had Murat so turned around that he was able to plant a little kiss on his back. Yes, that’s right…….a kiss. Referee Steve Smoger apparently thought it was cute, because he didn’t warn Bernard about his demonstration of affection. When Murat tried to retaliate, all he did was piss off Smoger. Any hope of wearing down the ancient one proved hopeless. Murat was the one gasping for air in the latter half of the fight instead of Hopkins. Showtime’s Mauro Ranallo, Al Bernstein, and Paulie “The Magic Man” Malignaggi all thought the judges’ one sided scoring might have been influenced by Hopkins advanced age. The trio felt Hopkins deserved the win, but they felt the scoring should have reflected a much closer fight. In the post fight interview, Hopkin’s answered a question about possibly fight Adonis Stevenson or Sergey Kovelev by saying he might have better, and more lucrative options at a lower weight class? When Jim Grey questioned Murat about the results, through a translator he complained about suffering two cuts over his left eye. He felt the cuts were due to headbutts from Hopkings. According to the Murat, the cuts bothered him to the extent that it adversely influenced his ability to fight. He should have talked to Rosado. It’s likely Gabriel would have readily swapped cuts.